As of writing, today over 2,220,000 blog posts have already been written. To say that there is no shortage of digital content is perhaps an understatement. And as we have shared in the past, this vast amount of digital content has ample quantities of quality information exclusively for event professionals. That’s why we’re featuring 6 more of our favorite event industry focused blogs that offer high quality, useful information for any #eventprof. 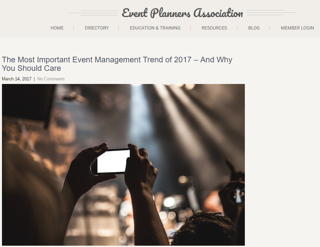 From sharing event marketing strategies to the latest trends in event technology, the Event Planners Association blog is a great strategy for the generalist event professional looking to gain more insight into the industry in whole. Though the name suggests 'meetings' - in the events industry, meetings have merely become a euphemism for the entirety of events - whether a meeting, conference or seminar. The entire SmartMeetings website is a news plethora of valuable information for event professionals. While the content RentLCS shares are unique to event audio and visual technologies - the information, resources, and examples that they share are truly resourceful. From innovative event design tips to experiential marketing ideas - the BizBash blog is full of useful information for event professionals in any industry. (Bonus: we recently shared ways in which Beacon's are revolutionizing events on the BizBash blog). While promoted towards the event management student - the quality, content, and resources available to these young up and coming event professional - is useful to green and seasoned event professionals alike. Cramer's content is more of a syndication of quality content throughout the web. From tradeshow websites and event venues to event professionals and companies - Cramer continuously shares high-quality content useful for all types of event industry professionals. As always, on the MeetingPlay blog, we aim to provide high quality and valuable information for event professionals. We hope by sharing these additional resources, events will continue to grow and the professionals behind them will continue to become stronger. Happy event'ing!